If set, bash replaces directory names with the results of word expansion when performing filename completion. This changes the contents of the readline editing buffer. If not set, bash attempts to preserve what the user typed. For example in your profile or wherever you feel it is useful. 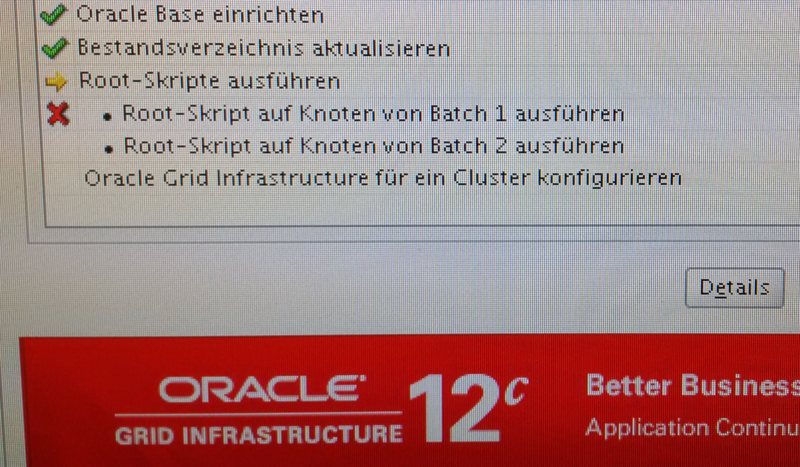 In my last post, I described a quick show case for Oracle 12c Automatic Big Table Caching. But ABTC is just a crock, nevertheless a useful one. The biggest help from Automatic Big Table Caching for “sustainable” database performance management is the temperature of segments, heated up by TABLE ACCESS FULL. In my case, after enabling ABTC the hottest segment was one I did not expect: A sink containing lots of passive data, a LIST partition holding the passive status. (Not) nice, and now the next question is, who does that? 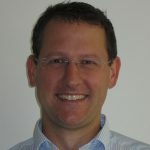 Too much TABLE ACCESS FULL in your Oracle Database? Thus, SQL elapsed time too slow for the demand? Plenty of Buffer Cache to create a temporary fix? maybe you want to consider Automatic Big Table Caching. Usually, Oracle only does Full Table Caching for small tables. Big ones will only use the Buffer Cache for the current chunk of blocks that’s transported (depending on the access method). Now Oracle 12c’s Automatic Big Table Caching will reserve a part (by percent) of the Buffer cache for full table scans, its filling priority is based on a heat map for segments: The more full table scans you have, the higher the “temperature” will get, and the higher the priority becomes. I calculated the target size of the cache by simply using the size of the segment I hoped to get cached. That’s amazing, and so simple and so intriguing and so SEDUCTIVE…! But after all it’s just a full table scan, and if we can get rid of it, we should still get rid of it, at least for OLTP environments. But for a quick fix (instead of using a hint) I think Automatic Big Table Caching has a real value. Sometimes Oracle Database 11gR2 complains about not being able to extend a (lob) segment with ORA-1691, but ASM monitoring based on USABLE_FILE_MB did not fire. Adding a new data file fails with ASM ORA-15041. I was under the impression this behaviour of ASM deserved some explanation. From April 10th to April 14th 2016 many Oracle professionals congregated in Las Vegas. The three big U.S. user groups, the IOUG, the OAUG and the Quest User Group once again formed one of the best Oracle Conferences in the world: COLLABORATE16. I was honored to be there as a speaker, and glad to perform two lectures in front of packed rooms (downloads here). Thank you all who made it possible and who attended! But this post is about what I took home from COLLABORATE16. I never take the time to write down everything. But wherever I go, I take notes what to look at when I am back. And as often, I’d like to share my very personal best-of list of souvenirs from Las Vegas. It’s ordered by time – first session first, and all of them are top notch state-of-the-tech speakers, no quality comments necessary. It’s always a privilege to meet you, thank you all for sharing your experience! Sometimes, it’s useful to see what’s currently going on in your Oracle Database. This query is meant to help with this task, that haunts every DBA from time to time. It’s just using v$sql and v$sql_plan, so no need for Enterprise Edition and Diagnostics Pack. shows the percentage of how much cost impact the most expensive object access has. related to the overall cost of the execution plan. has a limited view on object impact: Accessing objects is rated, but not that they cause bigger join costs etc. Yes, I did it again, submitted and got two papers accepted – speaking at COLLABORATE16 in Las Vegas (#C16LV) is always a highlight of the year! Please see details of the talks here, and follow my #C16LV posts on twitter! Big Thanks to IOUG, and see you in Vegas! The Oracle Magazine featured me in its January / February 2016 issue. I really feel honoured and would like to say thank you for the opportunity! For details, please see the Performing Databases Blog post about the publication. 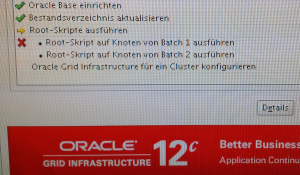 There’s always something to learn – for example about Oracle RAC (Real Application Clusters) and Dataguard. And the old-school frontal teaching concept is boring, and more important, ineffective after a few hours of passive listening. So the German Oracle Users Group DOAG organized a “noon2noon” event: “Oracle RAC and Dataguard” this week in Würzburg (January 2 1st-22nd 2016). It was the second noon2noon, after introducing the concept last year with Oracle vs. MySQL. I enjoyed it much last time, so I easily agreed to volunteer as a RAC Attack “Ninja” and tech guy on site for the workshops in general this year. But what’s that noon2noon thing? CRS-2799: Failed to shut down resource ‘ora.drivers.acfs’ – and thus, it was not possible to upgrade the grid infrastructure 11.2.0.3 to version 12.1.0.2 (rootupgrade.sh fails on first node, also when trying to stop the CRS for the same reason).